Absolutely! You can do this at any point. You do not need to wait until the next billing period to make changes to your hosting plan. Our advice is to start small and upgrade when you need more space. You'll be pro-rated the difference between the two plans based on where in the billing cycle your account falls. To upgrade your account click 'Active Accounts' and then click the drop-down and select 'Upgrade/Downgrade' to change your hosting plan. However, if your needs change and you realize you'd like a downgrade, that's no problem! 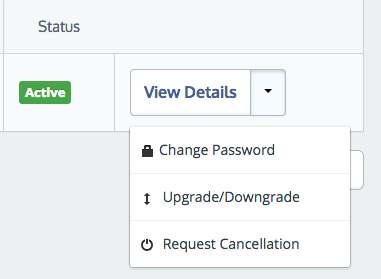 Clicking the same Upgrade/Downgrade button mentioned above will allow you to select a smaller hosting plan. To see if you're eligible for a refund, check out our refund policy here.